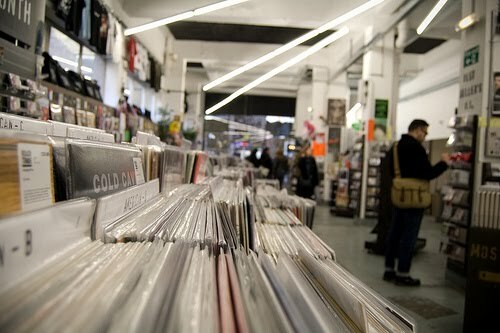 During the summer of 2007 a new Rough Trade Record Shop was launched in London's East End. It was 31 years after its partner store Rough Trade West was opened in Notting Hill. Generally speaking, the music industry was on a pretty slippery slope with record stores across the country disappearing at an alarming rate. Opening a new record store was considered a fairly brave if not ridiculous move. At the same time, thanks to an intensely time consuming job I had experienced a bit of a hiatus from the world of music and to put it simply, my soul was in dire need of musical replenishment. The only problem was, where was I to start? The sheer amount of music out there can be daunting when you've been out of the loop for a couple of years. I noticed an advert inviting the general public to attend a live interview with Geoff Travis, (founder of Rough Trade Records) at King's College, London. Geoff was there to explain why he was opening his new record store and to discuss the state of the music business from an artistic as well as a business perspective. This interview could not have come at a better time for me. As expected, the evening was very insightful and it was great to listen to someone who was still so very passionate about music after many years in the industry, I think I really needed to hear that. The most interesting part for me was when Geoff mentioned he read music blogs. I'm not sure I should have found this to be such a revelation, but I guess having grown up under the influence of a very established music industry who you could pretty much call the 'gatekeepers of organised talent', to hear now these very same people were also looking to the internet and reading what music bloggers had to say was something new. Music blogging had started to gain some sort of influence. Yes it makes sense now but I just hadn't realised it was actually going on back then. Indie music was no longer a one way flow of communications, controlled by record companies and magazines such as NME or Q, it was a free market of thought, opinion and creativity thundering along endless miles of fibre optic cable at an unstoppable rate. The next Arcade Fire or Gill Scott-Heron could be posting their home recordings from a basement somewhere in godknowswhereville and I could be listening to it in my own home on myspace. The thought of being a part of all this excited me a great deal. On leaving the lecture theatre on that cold November evening I decided to create this music blog. I was so excited and got straight to trying to think up a catchy name and design. Two years later I'm still here, perhaps not posting with as must frequency as I wish and I still have a lot to learn about writing (and music apparently) but whenever I need motivation I often find myself thinking back to the day Geoff Travis inspired me to write a music blog. Incidentally it's Record Store Day 2010 tomorrow (Saturday 17th April) and almost three years on, that 'crazy' idea of opening a record store is still working. 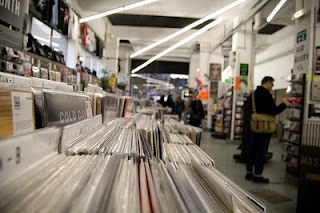 Rough Trade East is very much alive and kicking and one of my regular haunts for free instore shows and buying music. The Rough Trade team have organised so many awesome instore shows that I know have provided endless photo opportunities and talking points for so many aspiring music bloggers. Their influence on the blogging world can not be under estimated. So why not pay them a visit this Saturday, bring your kids along and get their faces painted up like the guys from Kiss (really! )-or just forget the kids and get yours done. Take a look at this list of acts they have playing live at both their stores and there will be special limited edition vinyl on sale, it promises to be a lot of fun. See you there! Record Store Day 2010 is happening across the world, find out what your nearest Record Store is doing to celebrate here.